Don’t tell me – the husband was not a man? … the man was not her husband! A great new novel by that was not ‘Riverworld’. A comment about this cover by a person who is NOT A WOMAN and NOT A FAN. Social rituals of the future! 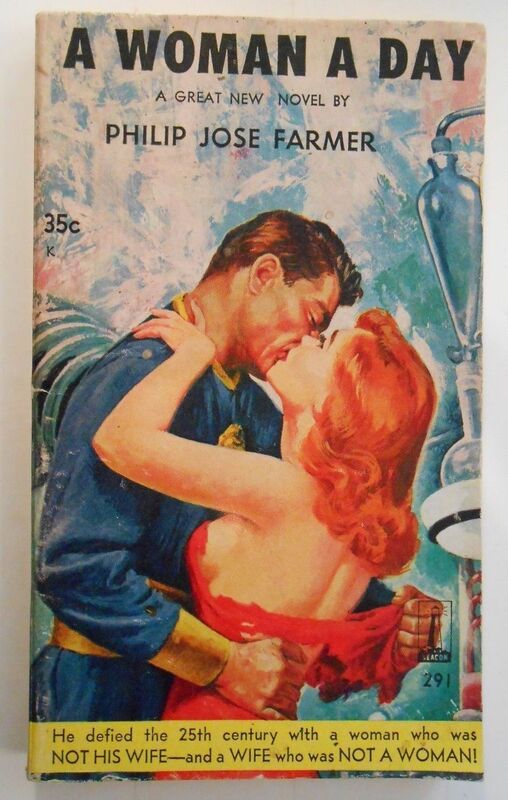 So the mode for guys in the 25th century is to tenderly embrace a woman with a manly kiss, so distracting her with your masculine masculinity that she doesn’t notice you silently ripping her dress to shreds. I would give them credit for featuring actual lab glassware like the separatory funnel, but I’ve never seen one hooked up that way. (Are the distilling directly into it? Why?) And they seem to running colored water through their condensation coils. Maybe that pile of vaguely wrong lab equipment is his wife who was not a woman. @B. Chiclitz – Weasels Ripped my Dress? It could be that he is ripping her dress so that he can use it to tie her up. He will either knot this woman or knot his wife. A woman a day certainly will not keep the doctor away. Well, that cover blurb really dated itself fast. @Anna T. – Yes, the blurb dated itself … but its self did NOT date a WOMAN! I’m not sure how her dress stayed on in the first place, as flimsy as it is. In the dystopian future, apparently men are wearing clothes made of rubber and women (wives or not) only get tissue paper. I am a woman and a wife (not his, thankfully) and I disapprove of all of this, including the wonky lab equipment and the stupid blurb, which less than 60 years later makes no grammatical sense. @drlemaster: I think you’ve caused a new tag to be added. GSS!